Road running is a kind of exercise; it’s kind of like running a Marathon. 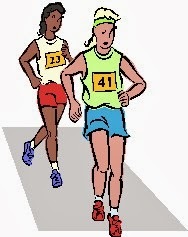 That is, the runners in a road running activity have to run for a long way in a set period of time. Nowadays, more and more Taiwanese people are crazy about road running because it is good for both their physical and mental health. If you are still a couch potato, you really have to get out and have more fun. Local road running groups are holding many interesting activities, and you are sure to find one just right for you. Basically, there are three types of road running activities in Taiwan. First of all is pure entertainment road running; you run slowly and just enjoy yourself. Afterwards, you can get some little souvenirs such as T-shirts, towels and caps. Second is a community-type road running activity; residents who have passion for running set up a running-club and then go on runs around their community at night. If you have trained and have ambitions, you can participate in the last type of road running activity – competitive running. In these races, the top 3 runners will get valuable gifts and cash prizes. Although there are many road running activities to choose from, road runners run mostly to keep healthy. In Taiwan, a woman called GinOy, a 28 year-old model and runner, regained her health by running. When she was young, she was very fat and had no confidence. She even had depression and lived in a depressive shadow for many years. However, now she became optimistic and very thin by running. You shouldn’t think that running is such a difficult thing; if you can listen to music and keep pace with the beat while you’re running, you will not feel tired. If you continue running for a long time, you will sure to reach your health goal. The other benefit of road running is that it keeps you mentally healthy. Baron Hansen, an experienced, once said, "Life is short... running makes it seem longer." When you’re running, enjoy looking at the surroundings and think about your life and what it means. Runners often find a different and new direction for their lives when they are running. Those who like running can always become more mature because they love thinking about life as they run. Road running not only keeps you physically healthy, it helps you grow spiritually, too. Unless you actually do it, it is hard to imagine how road running might change your life. I recommend that you try it; just do it. You will never regret it – and you might even love it!